Neck lift or lower rhytidectomy is a procedure to surgically tighten and suspend muscles of the neck. The goal of any neck lift is to tighten the skin, diminish wrinkled appearance and reduce sagging. It is most suited for healthy individuals between 45 to 55 years of age with complaints of next laxity resulting from the ongoing aging process. Indications for a neck lift. Upon a consideration of all the above, your surgeon will advice the most suitable technique for the neck lift. In all of the above techniques, incisions are strategically located under the chin and/or behind ears. Mini neck lift. The procedure releases the muscle from the skin, following which the neck muscles are pulled and tightened (CERVICOPLASTY). The overlying skin is pulled back, tightened, held in place, excess skin excised and the remaining sutured. Sometimes, the sutures are replaced with a special type of adhesive glue. Neck liposuction. A neck lift in combination with liposuction along the jaw line can yield very promising outcomes. Yet another neck lift procedure, referred to as PLASTYSMAPLASTY is aimed at reducing the banded appearance of the neck. Here, our surgeons will insert a tiny specialized instrument to realign or remove specific portions of the neck muscles, thereby tightening the middle area of the neck. Combination neck lift. 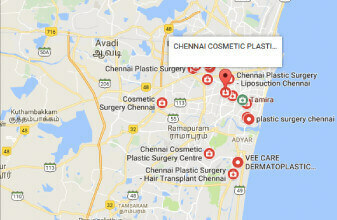 At Chennai Plastic Surgery, our team of skillful Plastic and Cosmetic Surgeons prefer to combine a neck lift with a facelift as they understand that the overall outcome will be more gratifying and truly understand your aspiration to look young. What to expect after the neck lift surgery? Our surgeons suggest that you keep your head elevated when lying down. A small drain tube will be temporarily placed under the skin to drain any fluid collection. Swelling and bruising to some extent after the procedure is unavoidable but can be kept to a minimum with cold compressions. The dressing is often removed in a day or two. Clients generally take 2 to 4 weeks to recover and resume work. Scars can be easily camouflaged with the appropriate hairdo / concealer and tend to disappear as they mature. Our clients are permitted to bathe and shower on day 3 following surgery. Care should be taken while combing hair. They are advised not to rub, wash or massage their neck unless our surgeons advise to do so. Neck lifts are safe. However, a loss of sensation along the incision sometimes occurs. Most often it is temporary and will settle in a few days. Very rarely, it could result in paralysis resulting from nerve injury. The only sensible way to avoid such complications is to select an experienced and qualified surgeon. And following the surgeon’s instructions will help resolve the issues to a great extent. Is a neck lift only for aged individuals? Though most patients opt for it after their forties, the neck lift can be performed in ideal cases, even if they are below 40 years of age. It can be performed on patients much older as well, with the age having no influence on the quality of outcome. What are the precautions following a neck lift?